Gale was only nine when he faced death for the first time. He was ambushed by one of the giant predators that roam the jungles of his homeland, Vindary. This harsh life is a blessing compared to the stories from the Homelands, hundreds of miles away. Stories of a dark age, of endless war and terror. The jungle and it’s perils shield the people of Vindary from the carnage of war. At least, that’s what they believed. In a single day, Vindary’s peace is shattered, its people trapped within their castle, besieged by a foreign king. 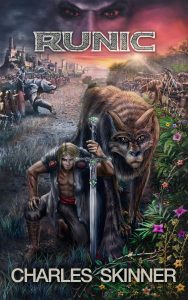 With food and water dwindling, Gale’s only hope of saving his people is to sneak out of Vindary, into the fabled lands beyond, to plea for help. For any normal man, this would be an impossible quest. But Gale is far from normal. When he’s gripped by rage, the laws of reality bend. He is a Runic, a remnant of a forgotten age. I had a strange dream which i could remember entirely, then 3 more a week later, each showing me parts of the same story. They were so vivid that i decided to write them down, and it grew into this novel. I received a lot of positive feedback on this story. So i decided to share it with the world. A mountain of water loomed beside his ship, drawing closer. Thayon braced against the railing. The vessel tilted as the wave lifted it up and up, until the whole ship was close to tipping over. Water struck him, roaring as it knocked his legs out from under him. Amidst the tumbling crates, the falling lines, and the flashes of lightning, there was a single point of calm. One of his passengers stood on the deck, perfectly still, oblivious to the streaks of light raining down around him. The cries of the wounded didn’t seem to touch this man, nor did it appear to bother him that they would soon find a grave at the bottom of the sea. Gand flinched, grasping his stomach. Blood gushed out from between his fingers. Their passenger was still motionless. His face was blank, as if nothing had happened. But his slender blade was drenched in blood. Thayon was not shocked by the speed of the attack. This man was one of the Sheel. If the legends were true, this was the least of what he could do. The ship started to tilt. The captain caught hold of the railing just in time to keep from being swept away. When he opened his eyes, the Sheel warrior was unmoved, as if the fury of the sea could not touch him. His dark eyes were still locked on Thayon’s. Gand was gone, taken by the sea.